Embroidered duffle bag. 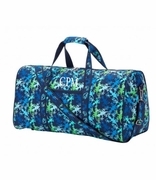 Personalize your travel experience with this classic monogrammed duffel bag! 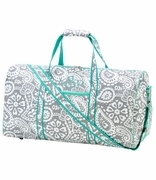 This duffle is perfectly sized for overnight trips or the gym. A stunning floral print of white, pink and teal on a navy blue background. Comfortable carry handles, detachable shoulder strap. Interior and exterior pocket, lined with footed bottom. Quality finishing with a roomy interior. 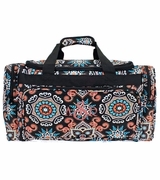 Embroidered duffle bag measures 21"W x 14"H x 10.5" across bottom. 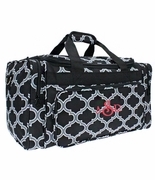 Medium weight blended fabric with zipper closure.